Ooh la la! I'm starting the weekend on a sweet note. 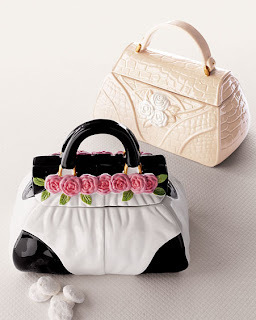 If you don't want to spend another fortune on Prada, Fendi or Valentino bags, Neiman Marcus makes these fashionable 'designer handbag' cookie jars for under $35. Well ... technically they're knock-offs, but who cares; your cookies won't know the difference! A Sweet Weekend to all! These jars are so sweet.... love them! Will post my award from you this week-end .... thankyou so much! I have been in Sydney so have been quite hectic. I am actually in Australia so it was only a 2 hour flight for me but whenever we go to Europe or England or America it is a very long way! Usually takes about 20 - 22 hours! Have a lovely week-end and thakyou for your comments... they are always much appreciated. Fabulous! I love the red Prada and the red buckle Fendi. Ha Ha...that was adorable...the perfect place to store all you sweet treats! Wow, those are adorable! too bad I just got myself a new cookie jar! OH my gosh, so adorable! Love handbags, love cookies, how can you go wrong?